Google hopes Duo will become the go-to app for video calls, but the odds could be stacked against it. GOOGLE’S ANSWER TO popular video chat apps like Apple FaceTime and Skype has started rolling out today. Duo was originally announced back in May, alongside new chat app Allo, as a way to replace the old Hangouts app, the standard Google app for messaging. Available for both iOS and Android, it’s Google’s attempt to not only simplify its messaging apps for users but signal a new start for its messaging service. The app started rolling out today, and will be available worldwide over the next few days, but it’s dealing with a tough market, and a tougher audience to win over. Its problems can be boiled down into three main points. Google already has a number of chat apps and services including Hangouts, Messenger (for SMS), Spaces (for groups), Gchat, and Google Voice (a US service which makes calls through Gmail). Adding Allo and Duo makes things more confusing. Not to mention the general messaging apps the likes of Samsung and Huawei include on their own phones. Despite being around for three years now, Hangouts has been all but forgotten by Google and releasing Messenger wasn’t exactly a vote of confidence for it. Either way, Google would do well to phase out Hangouts or if rumours are correct, turn it into an app for businesses. Hangouts Live has already been changed into YouTube Live so that process may well be underway. One of the major features included – but only available for Android users – is called Knock Knock. When someone calls you, you will see them (or wherever their camera is pointed) before you accept and turn on your own camera. The idea is you can use this moment to do something like make faces, show off something, or wave at the receiver. It’s clear that this is the feature Google expects to pull people in – it’s front and centre of its main promo video. Except on iOS, it only comes up as a general call icon. The reason for this is because Apple doesn’t allow third-party apps to use the lock screen for anything other than notifications. That’s a blow to it as it’s one of the few unique features Duo can offer. 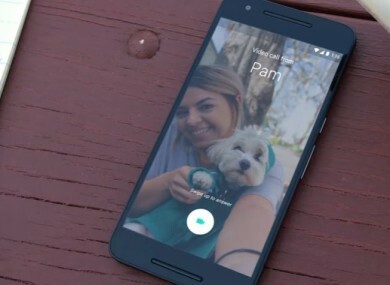 The other two things Google says makes Duo unique is a simple interface – you only need a phone number to sign up and you can make calls with one tap – and fast and reliable calls, with quality adjusting if a connection or reception quality dips. There’s nothing wrong with either, but it’s unlikely people will become regular users based on simplicity. Concept is usually better than execution – just look at Snapchat and how popular it is despite its interface being unconventional – and that’s difficult to nail. As for video call quality, it might not be as good as Google made it out to be. Up against Duo are a couple of apps that have been around for years. Skype and Apple Facetime are two of the most popular examples out there and those aren’t apps that are used too often for video calls. Each one includes voice-only calls which offers some variation, but Duo doesn’t have this. Since Google focused on simplicity – keeping the focus on doing one thing well – it means Duo will find it harder to gain traction. Everyone texts and makes calls but how often do you make video calls? If both Duo and Allo become the standard messaging apps for Android – similar to how iMessage and FaceTime are the standards for iOS – then it will have a good chance of gaining traction. Yet there might not be enough here for people to ditch FaceTime or Skype, no matter how much people may criticise them. If it arrived two or three years ago, Duo might have been able to make a dent in the market, but people’s habits are difficult to change. And arriving late to the game certainly won’t help it. Email “Google now has a true rival to Apple's FaceTime, but it faces many challenges”. Feedback on “Google now has a true rival to Apple's FaceTime, but it faces many challenges”.